Recorded on September 18, 2016. 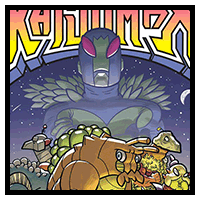 On a remote island in the South Pacific lies KAIJUMAX, a maximum security prison for giant monsters. Follow doting father Electrogor as he stands up to the cruel space-superhero warden! See corrupt guard Gupta manage his illicit uranium-dealing empire and pay off his gambling debts to the Queen of the Moon! Watch Mecha-Zon battle his own programming when the monster he was created to destroy shows up on the pound!